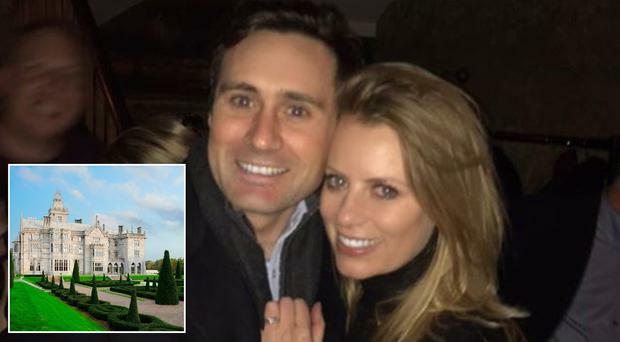 Sky Sports presenter Rachel Wyse has married her millionaire showjumper fiancé Tim Gredley. The couple tied the knot yesterday, holding their lavish flower-filled wedding reception in the stunning Adare Manor in Limerick. Guests congratulated the happy pair on social media, using the hashtag #gredwed to share their photos of the elegant day. Bride Rachel looked picture-perfect on the day wearing a beautiful lace high neck a-line gown with pretty capped sleeves and a nipped in waist, while for celebrations the night before she kept things simple in a sweet 'something blue' dress. On Friday night the couple celebrated with a party to welcome guests from the UK and Ireland to their Limerick nuptials, which saw everyone enjoying an evening of energetic dancing to music from a traditional Irish band. On the morning of the big day itself, bride Rachel and her chief bridesmaid and sister Gillian and their pals caught a few 'peaceful moments' on a beautiful walk around the grounds of the sophisticated hotel; 'her last walk as a single lady', one friend joked. The beautiful Adare Manor in Limerick was chosen as the setting for their lavish greenery-filled reception, where guests were treated to a delicious menu including an adventurous shell fish starter. Decor included elegant navy linens and huge floral centrepieces and dainty tea lights, while guests found their perfect photo frame with a stunning cream roses and greenery lined staircase. A 360 degree 'spinning' bar served drinks in to he night. After their first dance, to Can’t Help Falling In love With You, the couple partied the night away with their 14 piece band playing to a packed dancefloor which kept going well into the early hours of Sunday morning. Tim and Rachel had documented some of their plans ahead of the big day, with the groom posting a short video of their first trip to their venue, which he described as 'an incredible place', last summer. Adare Manor has been the venue of choice for several high profile weddings in the past, including US skateboarding legend Tony Hawk's big day back in 2015. Irish soccer legend Robbie Brady and his fiancé Kerrie Harris also tied the knot at the stunning venue last summer..
Tim and Rachel have been together for nearly two years, with the bride-to-be announcing their engagement on Instagram with a simple caption “the easiest yes”. The Sky Sports presenter previously told how she met Tim 13 years ago at a horse show in Cavan. “We weren't in each other's orbits at all through the intervening years. We just met up last year and it went from there. It's going great, I'm very happy." Wyse, a busy presenter who travels every week for the four months of the GAA championships, said the pair "just click". "If you want to make something work in life, there's always time to fit somebody in. It works for us. We just click and get on well. Of course, he's met my friends and we've lots of mutual friends. It's nice to have similar interests."